We want to tell you more about shark diving Cape Town. Great white sharks are not the only sharks you can experience when shark diving Cape Town. Have you ever experienced seven gill shark diving in False Bay? On our trip of the morning of Friday the 30th August, we had a lovely light northerly breeze that created a flat sea as we crossed False Bay to Seal Island. The morning was rather crisp with a few clouds, however as the day progressed and by the time we put our boat on anchor the sun had come out and we had pristine conditions. 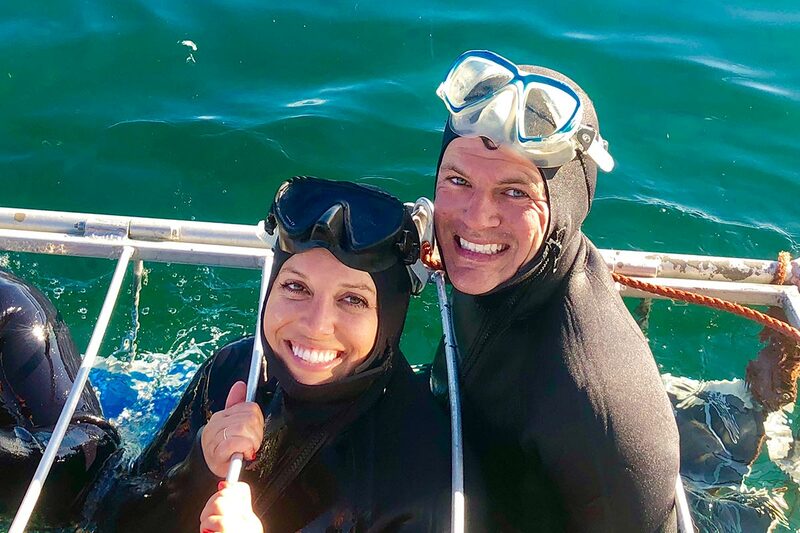 We anchored on our first spot and within a few minutes after the cage was deployed, a beautiful 3 metre female Prehistoric Seven Gill Shark was attracted to the surface for everyone to view. We encouraged our cage divers to jump into their wetsuits as quick as possible as this shark was a little ahead of schedule. As we all know nature has its own schedule. Once our divers were ready this beautiful female seven gill shark decided to take a “Coffee break”. We waited a little while hoping we could attracted her and maybe a few of her “sharky” friends to the boat, unfortunately to no avail. We decided to reposition the boat. This is something that we sometimes have to do up to several times in a day in order to find where the sharks are congregating. Once we had repositioned the boat within 3 minutes of our new position we had a Shark, and then another one and another one. Eventually we had 4 Seven Gills congregating around our boat and our cage at one time. 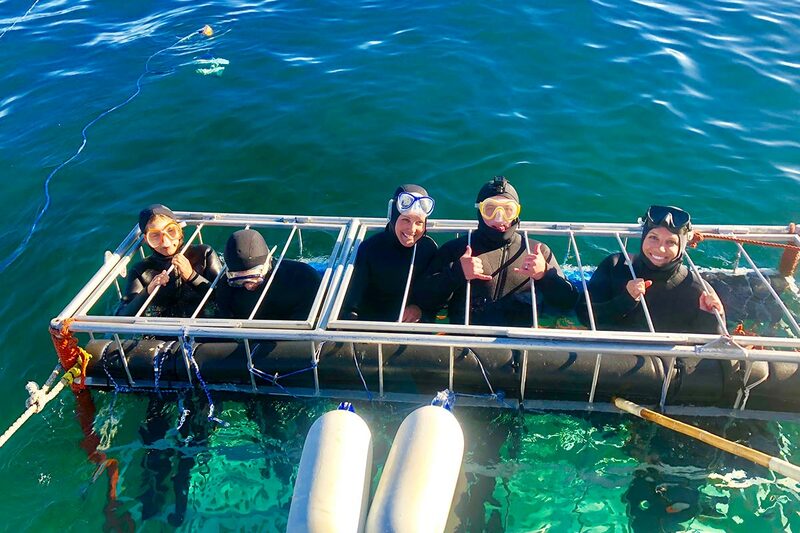 We managed to get all our divers through the cage twice. It was absolutely awesome to watch these incredible sharks interact with each other as well as with the cage and the divers in it. 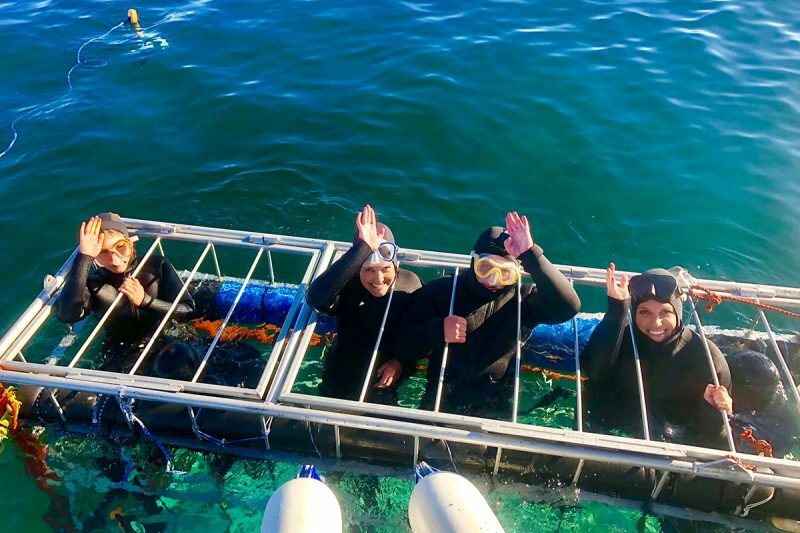 In total we had 5 Seven Gill Sharks that we attracted to our boat and a happy group of clients that enjoyed shark diving Cape Town experience. Seven Gill sharks are incredible special in their own right. There is not too much known about these animals but research has started on them , they were originally known as a deep water species but we find them here in South Africa in these incredible shallow waters 10metres/30feet, another area in the world where they are found in this shallow water is San Diego, USA. So come along on one of our Prehistoric Seven Gill Shark trips to experience one of the dinosaurs of our oceans. Right here in False Bay Cape Town South Africa.